When the weather is sunny, I love to make the most of it and cook on my barbecue as much as possible. It tastes great, and I love not being stuck in the kitchen cooking dinner! So when myBURGERbox asked if I’d like to try out their burger subscription box, it sounded ideal. What could better than using my BBQ to try out their burgers? I’m quite a new convert to barbecue cooking, and have only really got into it in the last few years. But our BBQ has had plenty of use this summer, and here are my tips for getting the most out of your barbecue. Choosing beef that has a good marbling of fat through it will mean that it’s basted from the inside as it cooks. This will help to keep the steak nice and juicy. Chicken and pork work well on the BBQ, but it’s a good idea to marinade it first and make sure you baste the meat so it doesn’t dry out. Of course, you don’t just have to stick to meat for a barbecue. Veggie kebabs work well, as does the classic corn on the cob. And you can even grill slices of juicy pineapple for pudding. It’s important to pick the right charcoal for your grilling requirements. Lump charcoal lights quickly and burns for around an hour, while briquettes can keep a consistent temperature for up to three hours. This makes them good for grilling large joints of meat in a covered barbecue. And the charcoal you choose can add extra flavour to your food, so give the quick light charcoal a miss if you don’t want your food to take on the flavour of lighter fuel. Look out for oak charcoal for sweet caramel tones. And you can even get wood chips that you soak and add to the hot coals for extra flavour. If you want to avoid food that’s black on the outside and raw in the middle, it’s really vital to make sure that you light your coals well before the time you plan to cook. The coals should be mainly ash-grey on the outside by the time you are ready to cook on them. I usually light my BBQ at least 30 minutes before I start cooking. Once your coals have been burning for about 20 minutes, you can start to arrange them ready for cooking. Generally you will spread the coals out evenly if you are planning to cook thin cuts like steaks, burgers and sausages. Cooking like this creates high temperatures and the right conditions for searing the meat. You can also push all of the coals over to one side of your barbecue. This creates high temperatures on one side of the grill and cooler temperatures on the other side. It’s perfect for searing the meat on the outside but allowing a slower cook, which works well for thicker cuts. The final method involves separating the coals into two piles at either end of the grill, with a drip tray under the grill and in between the two piles of coals. Obviously, you’re going to need specialist barbecue gloves and tools to do all of this. Then you put the meat on the grill in the space above the drip tray. This method is perfect for large joints of meat that need slower cooking over a low heat. Make sure you take meat and fish out of the fridge at least 20 minutes before you plan to cook it. This give it time to get to room temperature, and reduces the risk of it being burnt on the outside and raw in the middle. Obviously this is vital for chicken and pork produce to avoid food poisoning. But it’s also important for steaks as it gives you better control of how well done it is. If you’re not cooking meat that has fat marbled through it, then it’s important to lightly oil the meat before you cook it. Either brush the meat with oil or use an oil-spray to make sure you don’t add too much. You could even use a bunch of woody herbs like rosemary or thyme to brush the oil on, to give added flavour. Marinading the meat before you cook it will also help to keep it from drying out on the grill. But be sure to shake off most of the marinade before you put it on the barbecue. 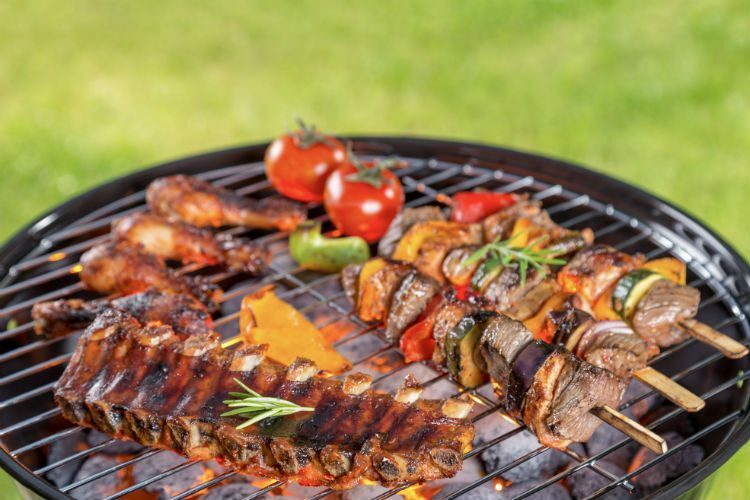 If oil or marinade drips down to the coals, your food will end up with a bitter, acrid flavour. This one is pretty important, especially if you are cooking a lot of food at different times. It’s hard to judge how well cooked the meat is just by looking at it. So be sure to either use a temperature probe to check the internal temperature or cut into the meat to check if it’s cooked through. If the meat is cooked on the outside but needs a little longer to cook through, push it to the outside of the grill so that it’s away from direct heat. We’re all used to resting the Sunday roast nowadays, but it’s just as important to rest your BBQ food as well. Resting the meat allows it to reabsorb its juices, making it more tender and delicious. Either rest the meat on the top rack of your BBQ if you have one, or pop it on a plate and cover with foil for a few minutes. Bigger cuts will need longer than burgers and steaks. The only reliable thing about the UK weather is how unreliable it is. So make sure that you have a back up plan for cooking your food in the oven or on the hob just in case it starts to rain. Luckily, there was no rain on the day that I tried out the myBURGER subscription Box! myBURGERbox is a gourmet burger subscription box. Each month, they send you a parcel full of different products and condiments so you can build your own gourmet burger. Each month’s box includes fantastic 6oz burgers. myBURGERBox use small scale farmers who share the same values of animal welfare. So the meat in the burgers you receive is of the highest quality. And as well as those chunky 6oz burgers, myBURGERbox also includes burger buns, cheeses, salads, condiments and an assortment of snacks. You can see previous boxes here. Unfortunately, it doesn’t look like vegetarian or special diets are catered for at the moment. You can either subscribe to have myBURGERbox delivered on a monthly basis, or you can just buy a one-off box. The packaging keeps the contents chilled for 48 hours, so you don’t have to worry about the food spoiling. You simply transfer the food to your fridge when you receive it. They are available for either one or two people, and you can even buy a gift subscription for a foodie friend. At the time of writing, a myBURGERbox subscription costs £12.95 for one person or £22.95 for two people. You can buy a one-off box for one person for £15.95 or £25.95 for two people. My box had a pizza theme, and so it included pizza sauce, pepperoni slices, pesto mayonnaise and a salad with black olives. I received my box on Friday afternoon and fired up the BBQ the following evening. It took a while for the coals to be ready and then for the burgers to cook – this was the ideal time to dig into the snacks provided in the myBURGERbox! When the burgers were cooked, I built my burger. The salad was looking a little bit limp after its journey, so I’d definitely recommend making sure that you have fresh salad on hand for your burger. And the brioche buns had taken a bit of a bash, I think they could have done with a bit of protection in the box. But they tasted good and were lovely and fresh. I layered up my burger with the sliced cheese, pizza sauce and pepperoni slices. The burger was really juicy, with masses of meaty flavour – it’s clear that it was made from good quality beef. I really enjoyed trying out myBURGERbox. I think it’s an interesting spin on the subscription box idea, and would make a great gift for a foodie friend. The burger was great quality, and I enjoyed the range of accompaniments. It will be interesting to see what the next theme is. And I thought the selection of snacks was a fun addition to the box. I do think that the packaging could be improved a little, but overall it’s a fun concept! And you could win a myBURGERbox to try for yourself in my new giveaway! Yes, one lucky SallyAkins.com reader will be able to try out myBURGERbox, as I have a box for two people to give away in this new competition. To enter this giveaway, simply log into the Rafflecopter below and answer the easy question. There are additional social media entries to boost your chances of winning this fantastic prize. This prize is a myBURGERbox for two people, for one month. The winner must supply their details no later than 5pm on 17th August 2018 or a new winner will be drawn on 18th August 2018. The prize will be sent out on 23rd August 2018, for delivery on the 24/25th August 2018. If you are not in to receive the prize, it will be left in a secure place. Please note that the packaging will only keep the food chilled for up to 48 hours from when it is sent out. This prize is not suitable for vegetarians or people on a special diet. And the question you need to answer to be in with a chance of winning this prize is: What toppings would you put on your dream burger? LOADS of strong Cheddar, Gherkins, Onions, English Mustard and Mayo! Caramelised bacon, red onion, lettuce, Jack cheese & a cheeky gherkin! Cheese and burger relish on mine. Yum! Halloumi cheese, jalapenos, dill pickles and some salad. Fried red onions, cheese and ketchup! Cheese, onions, mustard and tomato ketchup. Cheese, bacon, lettuce and BBQ sauce. My dream burger is topped with lots of onions. small amount of sweet chilli sauce on the bun, lettuce, tomato and blue cheese. Cheese, gherkins, mustard and mayo! Cheese, bacon, ketchup and a dot of BBQ sauce! Bacon, cheese, pineapple, peanut butter. yum yum! Cheese bacon and BBQ sauce! Cheddar, feta, bacon, lettuce and spinach leaves! Smoked bacon, gherkins, onions, blue cheese, american mustard and jalapeno relish. Weather is great for a bbq and i’ve just moved house so need to do some house warming bbq’s this would be great! Hard cheddar, gherkins, burger sauce, and salad! yum! For me it’s avocado, halloumi and mushrooms! Bacon, raw onion and brown sauce. Caramelised onion, cheddar, cucumber, lettuce. Cheese, onions and mushrooms with mayo, yum! I would love to put some blue cheese with mine -yum. Stilton cheese, a flat mushroom and crispy bacon! I would have… crispy onions, chilli jam, bacon, cheese and onion rings! cheese, bacon, onions, lettuce, tomato. Cheese, bacon & ketchup! Yummy! Blue cheese, gherkins and crispy bacon! Halloumi, sweet chilli jam, gherkins and salad. Onions, pickles, ketchup and mustard would go on my burger. I would have lettuce, tomato and ketchup on my dream burger. Caramelized Onions, Mushrooms and Tomato Relish. Maple-glazed bacon, cheese, red onion and BBQ sauce. Crispy bacon and blue cheese, the saltiness goes really well with a meaty burger. Just cheese, onions and tomato sauce.. I’m boring! bacon, cheese, gherkins, burger relish, crispy onions! My ideal topping would be a fruity mango salsa and smashed avocado with lots of black pepper! I like them simple :) onion, lettuce and possibly a splodge of tomato ketchup! Pepper jack cheese, bacon, onions and relish. Cheese, onion, and burger sauce. Smokey Bacon, Monteray Jack cheese, Aioli, tomatoes, rocket! Garlic mayo, gherkins, caramelised onions… to start off! Good quality cheese and maple cured bacon. Mature cheddar and red onions! A good cheddar cheese and barbecue sauce. Onions and mushrooms and tomato. I would top my dream burger with gherkins, spicy chilli cheese, bacon and burger sauce. Cheese, onions and burger relish! Cheese, BBQ sauce and an onion ring! Cheese, onion rings and bacon! I would definitely go big and have vintage cheddar, streaky bacon, caramelised onions, jalapenos and smoky chipotle mayo, yummy! Blue cheese, caramelised onions and fresh crispy lettuce!! Cheese, Bacon & mayo for me! Would have to be burger bacon tomatos and bbq sauce, nice and simple. Mines simple. Mozerella, bacon and tomato ketchup. I love goats cheese with onion rings, or even onion chutney with onion rings. My dream burger would be covered in mature cheddar, raw red onions and sweet jalepeno relish. Bacon, ketchup, a potato waffle, and a big dollop of chilli con carne. I’m a bit boring so I like a quality beef bruger, bacon, fried onion and ketchup! just fried onions on mine so nice and classic, pretty boring and run of the mill for most people but why over complicate something so tasty when simply does it often does the trick for my pallet anyway. Onion rings and sweet chilli sauce on top. So boring but I love cheese and gherkin! On my dream burger I would put grilled eggplant and maple bacon. As long as there’s cheese I’m happy! Cheese crispy bacon lettuce tomatoes mayo and maybe a pineapple ring – I love a well-filled burger. Bacon, cheese, jalapenos and BBQ sauce for me! About five different types of cheese! Cheese, Tomato, Burger Relish and Pineapple. Gruyere, gherkins and sauerkraut with a splash of mustard… Grandad would be proud! lettuce, bacon, honey caramelised onions, lots of cheese and a soft-yolked egg! Mines boring but I love it burger sauce, onion reish is it (the onions like you get in a macdonalds?) and loads of cheese! An egg and lots of mayo definitely for me! Cheese, bacon, mustard, tomato and brown sauce. Peanut butter, bacon and banana – its amazing!!! For me it’s got to have avocado on or it’s not even really a burger. I like burgers relatively plain – so just cheese and bacon is my ideal topping. fried onions, cucumber, sweetcorn relish, tomato ketchup and cheese! Mustard, tomato, onion, gherkin and pepper.